Historical novels are an excellent way to get a peek into a bygone era through the eyes of richly drawn characters. Whether those characters are based off actual people who lived during these times or are completely fictional, they still give readers a glimpse into what life was like in a certain period of time. Depending on what period of history you are interested in, there are usually hundreds of novels to choose from in this genre. Here are three we think are particularly well-written. 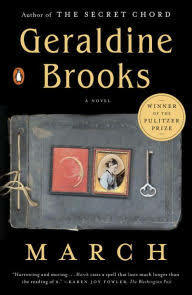 If you’re a fan of the classic Louisa May Alcott novel Little Women, you have to check out March by Geraldine Brooks. This Pulitzer Prize-winning novel tells the story of the March family from a different perspective — that of the father who is largely absent in Alcott’s book. Set during the years leading up to the Civil War, March is a devastating portrait of a good man trying to do the right thing for his family and his nation. It shows not only the strain war puts on a marriage, but also the ambiguous gray areas of morals and courage in a world turned upside down. This is a perfect choice for those who want a human and emotional perspective on the Civil War as well as those who want to get a deeper feel for what the characters in Little Women went through.